Just wanted to check in - I have had a couple of emails wondering if I am okay, as I have been flying under the radar this month. Thought I would fill you in! Some of you know that our Dd and Dsil are moving to Germany. For the next three years. They were here the first week of the month, then took a long overdue honeymoon to Hawaii. They spent some time with his family in Mesa, and returned here this week. They leave on Tuesday, so they have been our #1 priority. If I have failed to visit, I hope you understand! It's been a while since I've taken part in a challenge, and I love challenges! Decided to participate in the "Flowers for You" challenge at Impression Obsession today. When I checked my I-O drawer, it had very little in the way of flowers, so I improvised with embossed flowers, and the gorgeous bird complete with flower. I stamped the flower several times, and just kept adding layers until it was popped up enough to suit me, and then generously applied some Glossy Accents for a bit of happy shine. Wow, my pinks match very well here in real life - not so much, on the big screen! We needed to send a card to a gentleman at church, and my 'manly' stash was WAY down. 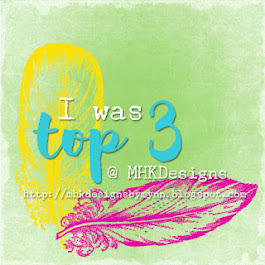 I decided to try out my new Gina K. Designs set, Poster Board Sentiments. Here it is with the flap open. I was careful to write our message on the left side of the card, so that only the ivory flap showed when closed. big words - really, really, REALLY want that one! It's rainy, dreary, and oh, so cold here! Oh, my! 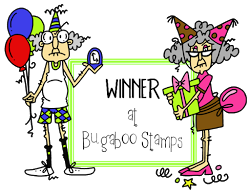 I have had such fun with a new stamp set, that I couldn't wait to share! creating some special Thank You notes, following our Anniversary Party last weekend. I first experimented with this set, "Floral Duet", but decided that I preferred the softer flowers in the above cards, with the nice long stems, and certainly loved the verse. in two shades of pink! This one needed a Thinking of You sentiment, for someone special. What do you think? Pink or blue? Hope that you are all enjoying a lovely weekend. a bit of laundry this afternoon. Welcome to Something Old...Something New! Each Wednesday, the Creations by AR Design Team members are taking turns sharing an older templat, and giving it a new look. Today, it's my turn to share. Adela's Brownie Box is one of my favorite templates, so WARNING - this post is photo heavy! This template is so easy to cut out, and can be used for any reason or season. I have no cutting machine, so I rely on my trusty scissors, and Adela's wonderful templates! You can get the templates in SVG, DXF, and PDF. I always use the PDF. The templates can also be reduced and enlarged to suit your needs. This box measures 2" x 3", and stands 1.5" tall. I just got out oodles of patterned papers and embellishments, and started printing and creating! I started yesterday morning at 8 a.m., and was finished with all boxes by 11:30 a.m. Gotta love a beautiful, quick, project! For additional inspiration using Creations by AR templates, be sure to check out the Something Old...Something New Gallery! It's a Creations by AR hop! I was unable to participate in today's Creations by AR Hop, but I've checked out all of the creations, and OH MY GOSH, OH MY GOSH! You simply must take a few minutes to hop and comment! 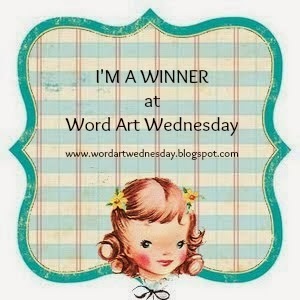 You could win today's fabulous template! 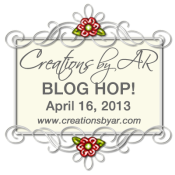 Start at the Creations by AR blog, and follow the links! 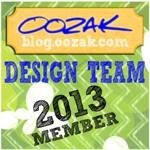 It is a lot of fun being on the Design Team at Oozak! Something tells me the four month term will go by SO fast. Don't forget to check out the DT Call at Oozak - it is going on until April 30th, and you could be the next lucky DT Member! Today, I am sharing a card for Oozak's April Challenge: Anything Goes, with Pearls, Lace, and Ribbon. La La Land 'Cowgirl Marci', Lace, Red Ribbon, Pearls, and Liquid Pearls from my stash, Sentiment: Hero Arts Classic Messages CL414, Copic Markers: E00, E21, RV21, E11, E13, E15, E31, E35, R27, R29, B00, B000, Spellbinders Romantic Rectangle Die, My Favorite Things Dienamics Cloud Die. Did you know that Oozak sells stamps, dies, paper cutters, patterned paper packs, and much, much, more? 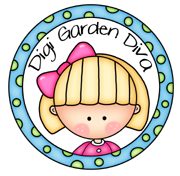 Check out the store, HERE! 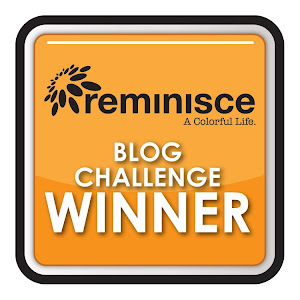 Be sure to enter your card HERE, using pearls, ribbon, and lace - you could be the next winner! Hugs & Smiles - Patti J. 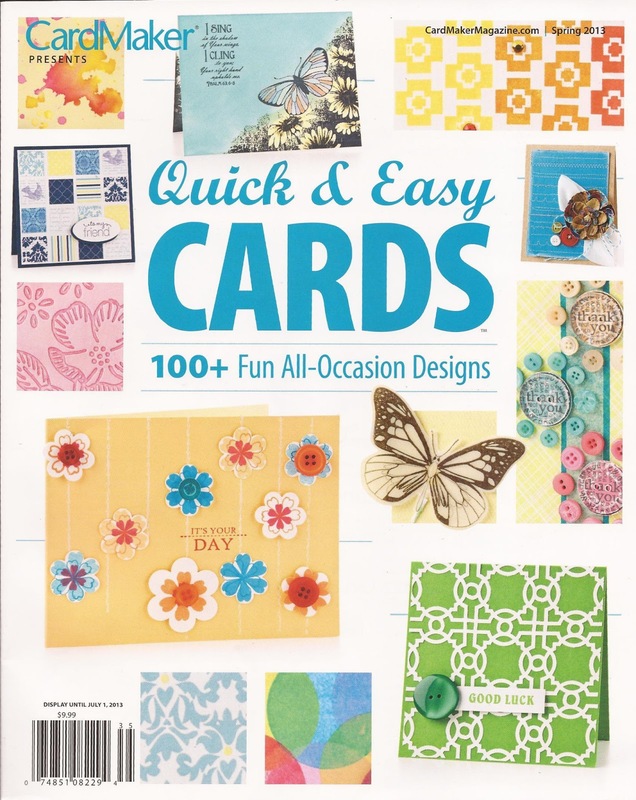 Have you seen the CardMaker Quick & Easy Cards Magazine yet? Here is a card that I made using Our Daily Bread Designs stamps. Wow, talk about an easy card! I felt truly honored to have several cards in the same issue as some of my uber-talented blogging friends! 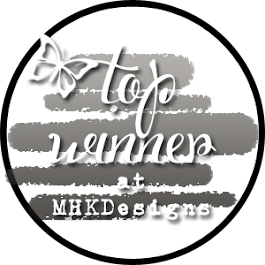 Someone needs to pinch me - I flip through these pages in awe of these designers! Another 'pinch me' moment - you can see just a snippet of this on on the cover of the magazine! Woo hoo - first time for the cover! Hope you are having a great weekend. I am on my way to a New Puppy Shower in the park! I actually cased a card from this magazine to take today. I'll post the card tomorrow! Today, my DH and I are celebrating our 40th Wedding Anniversary. This week has been full of family and friends arrving from out of town, and out of state, to share in the celebration with us. Our two grown children have teamed up and are having a party for us at a local vinyard this afternoon, and we are looking forward to seeing even more friends and family! I'll try to have a photo to share in the next post. I thought I'd share a card with you that was published in CardMaker's Quick & Easy Cards Magazine. If you haven't seen this one yet, you are missing out! Great photos, and so much inspiration! Have a wonderful day, and thank you for being patient with me the past week or so, as my time has been devoted to visiting with family! Our DD and her DH will be moving to Germany at the end of this month, and will be gone for three years, so we have been spending as much as we can with them. The scale was good to me this morning - down 2.4, for a total of 58.9! Best ever birthday gift! Here is another quick post to share. Again, I used the same stamps, same papers, different colors, to get out a couple of notes to our church choir director and her choir, and a friend who sang a solo in Sunday's Easter Cantata. Time in my girl cave has been minimal, so these 'same' type cards are the easiest right now. I apologize for my lack of visiting your blogs, but right now, I'm spending every spare moment with DD and her DH. I'll be stalking you again next week!